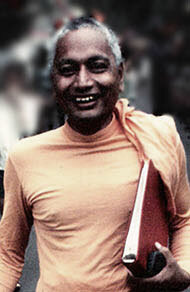 Swami Sivananda put him to work in various departments of the ashram - kitchen, temple, office, typing, the press etc. He then became the private secretary to Swami Sivananda, dealing with correspondence, typing books, etc. and generally helping in his day-to-day activities. Swami Venkatesananda spent seventeen years at the feet of his Master, Swami Sivananda, before commencing, at his Master's request, his mission to countries outside of India in 1961.